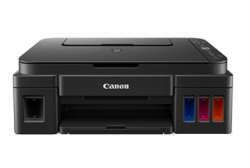 Canon Pixma G3010 printer built in integrated ink tanks create a compact printer body. Users can also view remaining ink levels easily at a glance. The ink bottles come with a special tip design that reduces spillage during ink refilling. Choose from over 100 types of templates to create posters or flyers for small businesses. Connect to your smartphone easily.